How many books are published each year worldwide? Which country publishes the most books? And what about readers - how many people read books, and how many are read, on average? That's some of the questions i pondered and googled in the last days. Below, some of the answers. 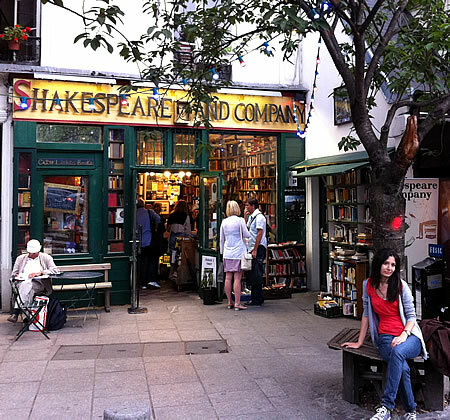 And above, to add some real books to all the numbers, a photo of a wonderful international bookstore: Shakespeare and Company, full of english books, in the middle of Paris. 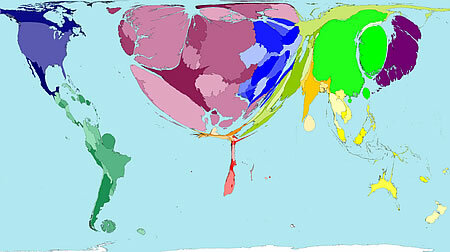 The following map is from Worldmapper, based on 1999 statistics. According to their database, the sum of all new books titled published worldwide in 1999 was: 1 million. Based on the number in total and numbers per country, they created a map that shows the distribution of the new books worldwide. The most new titles were produced in the United Kingdom (pink), China (green), and Germany (darker pink). This map shows the distribution of new book titles published (not copies sold), with countriews re-sized according to the amount of new books published there. Western Europe dominates this map due to the high number of new books published there. On the other end of the scale is Africa - the map tells its own red story of how the stories of almost a whole continent are lost. 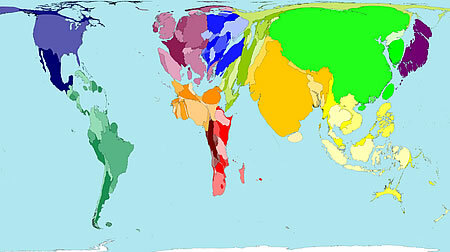 Here is the link to the original map: "Books Published" - Map by Worldmapper. A number that is included in their page: "The world rate of new titles is 167 books being published per million people per year." That would make it 1.6 books per 1000 persons. It will be interesting to see how this number has changed / will change in time with e-books and POD-services. If you are surprised that China and India is so huge in the map - that's not because the literacy rate is highest, but because the overall population in those areas is very high. The listing of literacy rates can be found at wikipedia: wiki/literacy. It comes with a blind eye, though, and states: "For highly developed/high income countries where literacy statistics were not collected, a rate of 99% was assumed." It's hard to imagine, and a topic that isn't often discussed, probably also because many in this group aren't ready to talk about it, but instead learned how to cope with it. also, for migrants, there are special language courses, as obviously, they need to learn the new language first. but generally, it is expected that every adult can read, especially Germans who grew up in Germany (the majority or the functional illiterate are Germans). "I can't - " Alice stopped again, and took a deep breath. "I can't - read very well." Mrs Chandra looked amazed. "What has that got to do with anything?" "Everything," Alice said. "Everything. It makes me - different." One in four adults read no books at all in the past year, according to an Associated Press-Ipsos poll. Who are the 27 percent of people the AP-Ipsos poll (2007, Link) found hadn't read a single book this year? Nearly a third of men and a quarter of women fit that category. They tend to be older, less educated, lower income, minorities, from rural areas and less religious. At the same time, book enthusiasts abound. Many in the survey reported reading dozens of books and said they couldn't do without them. Among those who said they had read books, the median figure _ with half reading more, half fewer _ was nine books for women and five for men. The figures also indicated that those with college degrees read the most, and people aged 50 and up read more than those who are younger. According to a "Lesen"-survey from 2008, 25% of the adults said they read no books at all in the past year. On the other end of the reading spectrum are 25% who read between 11 and 50 books per year. 3% read more than 50 books per year. (adults include readers over 14 years). Another large survey asked for the number of books read in the last year: the average numer of books read in Germany is: 9 books. (the survey also included Switzerland (average 8 books), and Austria (average 11 books). This is all very interesting. I will have to look at it again in detail. From personal experience I know only two things: 1. All I do IS read - massive amounts continuously; 2. As a small publisher, almost impossible to get someone to buy a book (even family). Glad to hear, though, that the word is not dead yet. How could it be? We are the only species with this ability (and it has taken us a very long time to develop it). Great post. Mexico grew quite a bit in that second map. Interesting stuff. Yes, so interesting! For me, some of the figures are expected, and others are almost surreal, like the percentage of functional illiterates here. 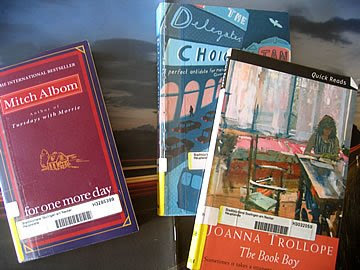 Right now, i am piecing together a larger post for World Book Day - more about that when it is online.